"Abraham and Sarah, David and Michal, Joseph and Potiphar’s wife, Ecclesiastes and Mishael, and other biblical characters peek out with a wink and a smile from the pages of the Bible. They are vibrant folk, driven by impulses and desires, subject to whims and to the twists and turns of fate. They sin and they go astray – just like us. From the distance of time, one can hear the dramatic pulse of the biblical stories and discover that the characters – the well known and the less known – still have something to say to us today. Is the human condition in the 21th century any different to that of antiquity? Not necessarily. In writing this book, I wanted to go back to the tradition of dramatic rhyming verse, to popular Jewish balladry, and to the biting cabaret of Berthold Brecht. The words wave hello to earlier times, and particularly to the poet-playwright Itzik Manger, a father of Yiddish theater, whose stage works have been with me since my childhood with all their dizzying theatrical and literary spectacles. Perhaps the time has come to acknowledge these underground sources that feed our Israeli identity, and to create a renewed partnership with them." From Nava Semel's preface to Hymn to the Bible. A rich and marvelous collection. Daring and un-prettified contents. The innovations that this book heaps upon us are manifold. The rhyming is sophisticated, delightful, but also demands contemplation and investigation, with its dazzling use of the different layers of Hebrew, both ancient and modern. Nava Semel’s attitude to the heroes of the Bible is intimate, at eye-level, and unbiased. This is a living, and enriching depiction of characters who are intertwined with God, with others and with themselves. She gives a voice to the silent and to the silenced. Her book is replete with high points. Each poem provokes thought, soul-searching, empathy. The humanistic- ethical- Judaic world outlook finds expression anew in each poem … Such literary interpretation has a very long tradition in Hebrew culture and literature, and this book adds an important, challenging and original layer of bricks to that magnificent structure. The humor in some of the poems infuses them with a peaceable tint. I only hope that this book finds an echo in the hearts of a good many people and that it will perform its humanist-Judaic work upon them. 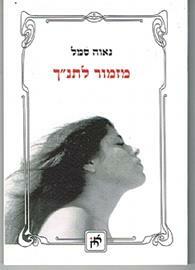 A refined and unique book, abounding in love of Hebrew and love of Hebrew culture. A really intriguing book … The book takes the Bible stories to places that are daring even to the secular reader. Hymn to the Bible is something of a refreshing breeze …You have to read the book and to take pleasure in the beauty and the purity of the words of the poems … It’s fun to tuck into the Bible’s legends, into the mythology-history-philosophy from which the Bible is molded, when it is all served up in so intriguing a dish. Well worth reading … A different way of looking at the Bible. An author blessed with talents. A particularly original work. A surprising book. Modern, contemporary interpretation of the Bible that gives it topical significance and removes it from the sphere of religion. A remarkably courageous book. An enchanting book, in both content and form. Rare in these parts. Original and modern interpretation, refreshing … A thought-provoking book. Very highly recommended. A very interesting book, full of up-to-date, topical interpretations. The Bible speaks to Nava Semel and she speaks back to it. An excellent book … A book that does not paint the people of the past in a prettier way, but rather depicts them as human beings. A pleasure to read. I read it, and can never get enough of it. Nava Semel has been blessed with a talent for getting deep into the reader’s soul. A treasure of a book.